Ira Helenius, MD, Medical Director at UMA (L); Mohan Nadkarni, MD, Division Chief for General, Geriatric, Palliative and Hospital Medicine (R). Both are Firm Attendings at UMA. Residents in the Categorical and Primary Care tracks provide comprehensive, on-going care to a panel of primary care patients in our university-based general medicine clinic, University Medical Associates (UMA). UMA is housed in a recently renovated, dedicated space with computers in each exam room; it utilizes EPIC, the hospital-wide electronic medical record system. At the beginning of their PGY-1 year, residents are assigned to an outpatient “firm” at UMA; this is where they work during the “+1” ambulatory week. Each firm is composed of a general internal medicine faculty member, who serves as director/mentor; a nurse; and approximately six residents who follow patients under their care over their three-year residency. This team approach yields optimal patient care while facilitating the development of mentoring relationships between faculty firm leaders and residents. With a base of 11,000 patients and an average of 25,000 patient visits annually, the UMA practice offers ample opportunities for long-term patient management and continuity of care. Residents interact with an array of health service providers at UMA, including full-time clinical pharmacists, nurse practitioners, diabetes educators, a nutritionist and a social worker. A daily outpatient morning report and longitudinal primary care curriculum are integrated into the UMA training experience. Migrant Health Eastern Shore — During this one-month rotation on the Eastern Shore of Virginia, participants provide primary care to a rural, underserved, cross-cultural population of local residents and migrant farm workers, in several different settings — at a clinic, in migrant farm-worker camps, and on the tiny island of Tangier (reached by boat or small plane). This is a rich environment for learning about public health and cross-cultural/international health. Indian Health Service — This one-month rotation at one of our affiliated Navajo Reservation sites offers an opportunity to provide primary care to underserved Native Americans and to learn the tenets of cross-cultural medicine and population-based health. 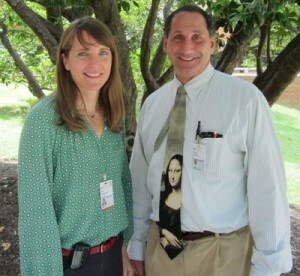 Residents are supervised by a UVA Internal Medicine program graduate. International — Residents can choose overseas rotations at sites that have an established relationship with UVA, including facilities in Kenya, Uganda, Saipan, Brazil, and India; or, they can design an overseas rotation experience that enhances their cross-cultural training while meeting specific practice goals. Conventional electives may involve outpatient clinical experiences focusing on general medicine or subspecialty rotations that can introduce residents to attendings and staff who can promote their interest in specific fellowships. Also available are inpatient consultative experiences, usually in the medical subspecialties. Residents can also be involved in research blocks designed to allow protected time for resident research projects. Residents are also encouraged to use elective time for international rotations. During these elective months, residents participate in clinical experiences and a structured ambulatory curriculum that progresses through the three years of training. To ensure that all residents receive the same curriculum, they are scheduled for at least one ambulatory block in the fall and one in the spring of each year. Conventional electives may involve outpatient clinical experiences focusing on general medicine or subspecialty rotations that can introduce residents to attendings and staff that can promote their interest in specific fellowships. Also available are inpatient consultative experiences, usually in the medical subspecialties. Residents can also be involved in research blocks designed to allow protected time for resident research projects. Residents are also encouraged to use elective time for international rotations. During these elective months, residents participate in clinical experiences and a structured ambulatory curriculum that progresses through the three years of training. To ensure that all residents receive the same curriculum, they are scheduled for at least one ambulatory block in the fall and one in the spring of each year.